LONDON, UK, February 21, 2012 (ENS) – More than 145 food products derived from whales, dolphins and porpoises are for sale on Amazon Japan, the wholly owned subsidiary of Internet marketplace giant Amazon Inc., according to a new report by the nonprofit Environmental Investigation Agency. In 2011, EIA investigators purchased whale products from Amazon Japan, including canned whale meat, whale jerky, whale bacon and whale stew, some from endangered species. Many of the products were found to be contaminated with toxic mercury at levels far higher than Japan’s allowable limit. The report, “Amazon.com’s Unpalatable Profits,” was published today in co-operation with Humane Society International. The groups also released a short campaign film urging consumers to tell Amazon chief Jeff Bezos to “immediately and permanently ban” sales of all cetacean food products. “We are appealing to Jeff Bezos and Amazon to ensure that Amazon’s ban includes all trade in products from whales, dolphins and porpoises across all of Amazon’s websites,” said Thornton. Founded by Bezos in 1995, Amazon.com has its headquarters in Seattle, Washington, and has established subsidiary retail websites in the UK, Canada, China, Germany, Italy, Japan and Spain. Thornton says Amazon has been silent about the whale, dolphin and porpoise products offered on its Japanese website. “We have not received any response from Amazon, though we sent our information to the “jeff@amazon.com” email address, and couriered three hard copies of the EIA report last week to Jeff Bezos, copied to two other senior Communications persons at Amazon,” he told ENS today. In December 2011, EIA investigators found 147 whale products for sale on Amazon Japan, including foods made from fin, sei, minke and Bryde’s whales. These species all are protected by the International Whaling Commission’s moratorium on commercial whaling and the Convention on International Trade in Endangered Species, which forbids international trade in species on its lists. 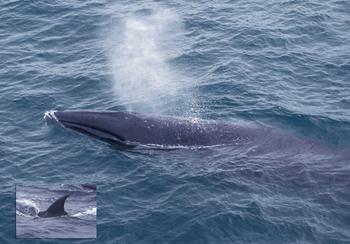 The IUCN Red List of Threatened Species classifies both fin whales and sei whales as Endangered. 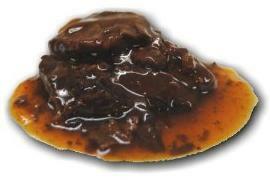 Nevertheless, several companies were selling fin whale meat imported from Iceland on Amazon Japan. EIA investigators purchased eight whale products from Amazon Japan in 2011. Analysis revealed six of them to have mercury levels exceeding the Japanese national limit for mercury in seafood of 0.4 parts per million and one had a mercury level of 20 ppm, which is 50 times the allowable limit. 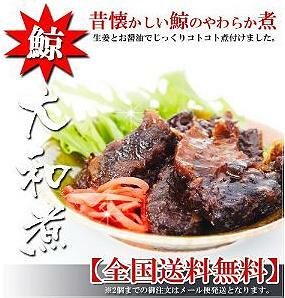 One-third of the 147 products were not listed with a species name, contrary to the requirements of Japan’s labeling laws. Since many of these products originate from Taiji, where 10 times more dolphins are killed than whales, it is likely Amazon Japan is selling dolphin products mislabelled as “whale,” the investigators believe. International condemnation of Japan’s cetacean hunts, coupled with concerns about pollution and food safety, have already spurred several of Japan’s supermarket chains to ban the sale of whale and dolphin products in thousands of stores. The U.S. and UK-based Environmental Investigation Agency and Humane Society International are calling on Amazon to do the same. Despite a worldwide moratorium on whaling established by the International Whaling Commission that took effect in 1986, Japan has been conducting lethal “research” whaling since 1987. Japan holds the view that this whaling is permitted under IWC rules, although IWC member governments have repeatedly passed resolutions against the practice. Japan sells the meat, which the Institute of Cetacean Research in Tokyo considers a “byproduct” of its research whaling progam, “to make the provision of cheap whale meat as much as possible to all levels of civil society,” the ICR says on its website. 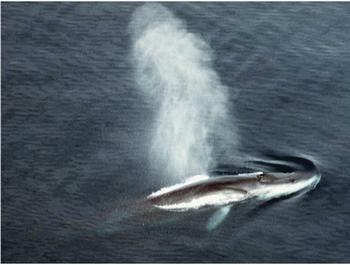 Fin whales, Balaenoptera physalus, were depleted worldwide by commercial whaling in the 20th century. Fin whales have been protected in the Southern Hemisphere and North Pacific since 1975, and catches ceased in the North Atlantic by 1990, except for small “aboriginal subsistence” catches off Greenland. Commercial catches resumed off Iceland in 2006, with nine fin whales taken that year. The Japanese fleet resumed catches of fin whales in the Antarctic in 2005, taking 10 whales each during 2005/06 and 2006/07, with plans to take 50 per year from the 2007/08 season. Interference with the Japanese whaling fleet in the Southern Ocean by the Sea Shepherd Conservation Society has prevented fulfillment of these plans. Sei whales, Balaenoptera borealis, were intensively exploitated by whalers in the Southern Hemisphere and the North Pacific from the late 1950s to the mid-1970s, following the depletion of blue, fin and humpback whales. In the eastern North Atlantic, the population appears not to have recovered from early modern whaling. Commercial exploitation of sei whales ceased in the North Pacific in 1975, in the Southern Hemisphere in 1979 and in the North Atlantic in 1989. Catches by Japan under scientific permit resumed in the North Pacific in 2002: since 2004, the annual self-authorized Japanese quota has been 100 sei whales.